Combine peanuts, graham cracker crumbs and melted butter. Press crumb mixture into 9-inch spring form pan. Chill crust for 20 minutes. 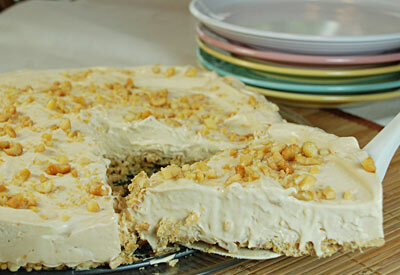 Using electric mixer, cream softened cream cheese and peanut butter until fluffy. Gradually add condensed milk and mix well. Add lemon juice and vanilla and blend well. Fold in whipped topping. Pour mixture into prepared crust. Garnish with chopped peanuts. Chill 2 to 3 hours.